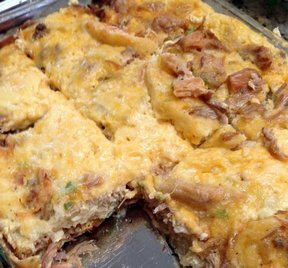 An omelet is usually made with two or three eggs and is cooked very quickly in a sauté pan. As with so many established recipes and cooking techniques, the French are the masters of the omelet, which if cooked correctly, is light, moist, and slightly puffy. 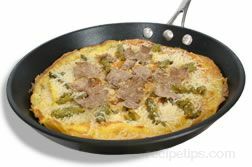 A nonstick pan works very well for preparing an omelet and is often preferred by the home cook, but professional chefs use an iron pan with a long handle that can be exclusively used for omelet making. A properly seasoned iron pan can be cleaned after each use simply by wiping it with a clean cloth or paper towel, rubbing the pan with salt, and giving the pan a final wipe to remove the salt. 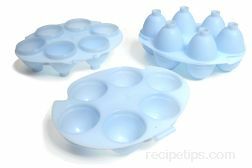 The salt treatment helps prevent eggs from sticking to the pan the next time it is used. Regardless of the type of pan that is used to prepare an omelet, the bottom of the pan should be about seven or eight inches in diameter so that the height of the eggs within the pan will be no more than one-quarter inch (the height of two or three eggs, depending on size). To begin preparing an omelet, crack open 2 or 3 eggs over a bowl, add salt and pepper (optional, if desired), and stir the eggs just until the whites and yolks begin to blend. The eggs should not be beaten vigorously. 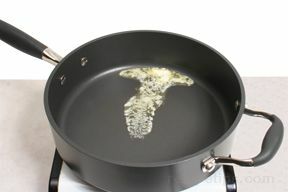 Place the sauté pan on high heat and thoroughly coat the bottom and sides of the pan with butter. After the butter is melted, it will begin to foam. 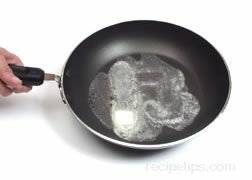 When the foaming stops, the pan is hot enough to begin cooking the omelet. Make sure the pan is not so hot that the butter begins to brown. 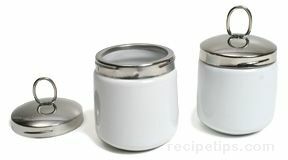 If this happens, the butter will quickly reach its smoke point, which will cause an unsatisfactory result. 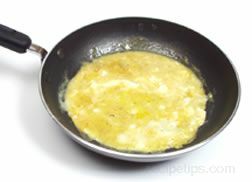 Once the butter is heated to the correct stage, pour the eggs into the pan. 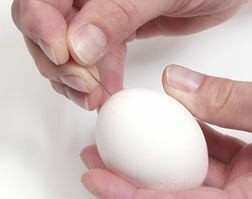 The eggs should begin to coagulate almost immediately. 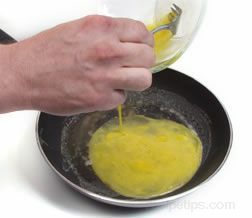 Using a few side to side and turning movements of your arm while grasping the handle of the pan, distribute the eggs in the pan, creating an even layer over the entire bottom of the pan. After heating for a few more seconds, the eggs should begin to form into a mass resembling the unfolded omelet shape. 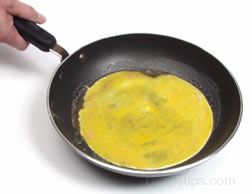 Jerking the pan toward you should cause the omelet to roll over upon itself as it hits the side of the pan. Continue doing this for a few seconds until the omelet is folded into a pleasing form. After tilting the omelet from the pan onto a plate, it is ready to serve. 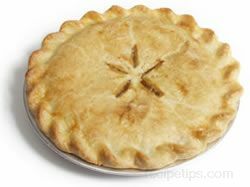 The actual cooking time is usually no more than 30 to 45 seconds. 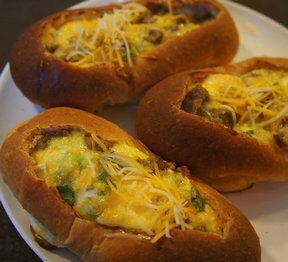 The omelet should be tender and moist. A dry omelet indicates that it has been cooked too long. Additional ingredients that are finely chopped, ground, or powdered (such as herbs and spices), can be added to the eggs before cooking without affecting the outcome; that is, the extra ingredients will not necessitate a change in the cooking procedure of the omelet. 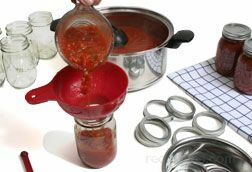 However, the cooking time may change slightly depending on the amount of the extra ingredients that are added. 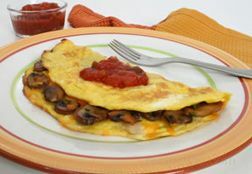 Ingredients that are more substantial in volume (such as cheese or chopped meat), should not be added to the omelet until after the eggs have coagulated, but the ingredients must be added prior to flipping the omelet in half. These ingredients are placed on one side of the omelet; then the omelet is folded. 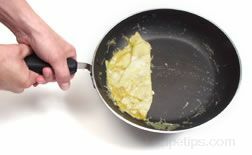 Folding the omelet in the pan using the flipping technique might not work as well as it does when folding a plain omelet, so a spatula is most often used to fold the omelet in the pan. 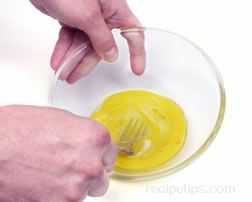 The extra ingredients can also be placed on top of the plain omelet immediately before serving.